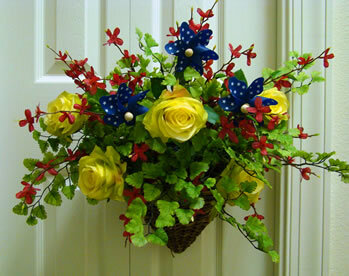 Memorial Day decorations can be very cost effective if you keep them around for all the summer holidays like 4th of July and Labor Day! This Memorial Day I decided that I didn’t want to go crazy with the red, white and blue because that to me is The 4th of July! Instead I wanted to add touches of the tried and true trio in different color combinations that gave the impression that summer is close and flowers are blooming everywhere! I started my Memorial Day décor at the front door to show all who pass by that I’m in the spirit of this very important holiday. 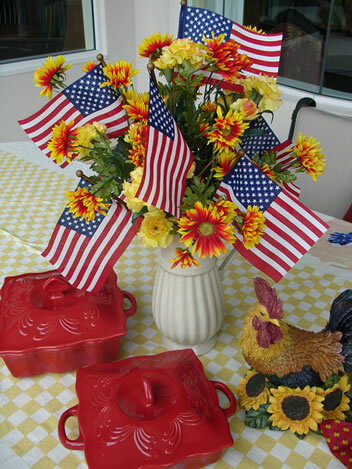 Sometimes it’s just the right centerpiece that makes the dinner table look festive, and this one with the orange and yellow mums becomes the perfect background for smaller American flags that fill in the centerpiece nicely. The orange and yellow don’t detract from the proud American message, but add warmth and welcome for a lovely Memorial Day celebration. Combine the texture of a woven placemat with a warm printed cloth napkin, wrapped in a blue paper napkin and tied with a red and gold striped ribbon. 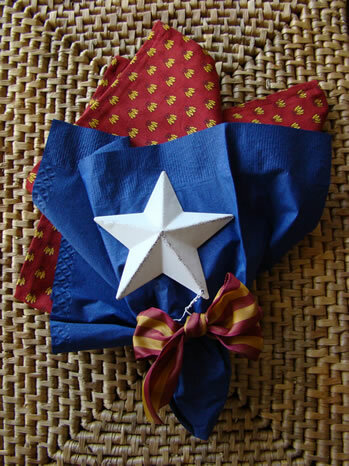 The white metal star is a Christmas ornament that does double duty, working in the winter on the Christmas tree and working hard all summer long for all the patriotic holidays. 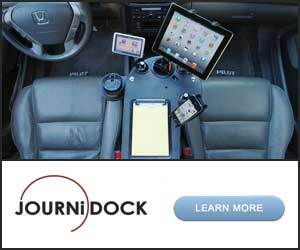 Now that was a smart purchase! 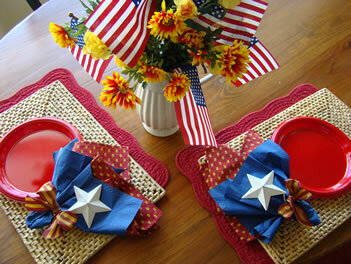 Here I’ve used those pretty napkin bunches with a layered red placemat and good old fashioned red picnic plates. You don’t have to pull out the good dishes for every holiday. After dinner, let your guests dispose of the plates in the appropriate recycling container and skip the whole clean up step! 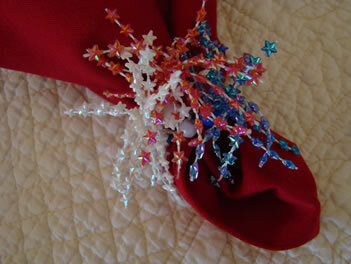 I especially like to use things I already have around the house that are in the appropriate colors for the celebration. I think found items make a more interesting display than something you might specifically go our shopping for. 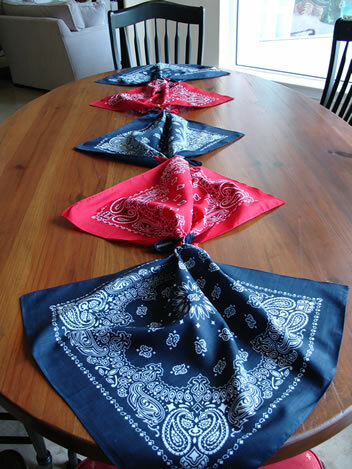 This is the case with the red and blue bandanas I found in my scarf drawer. Why did I have this collection? I’m sure it had to do with the kids but I honestly don’t remember. In any event, they can be great for table decorating. Just look at these options I whipped up! They make a great flat runner simply laying them down along the center of the table and overlapping as necessary to make them fit. Add a centerpiece and you’re done! 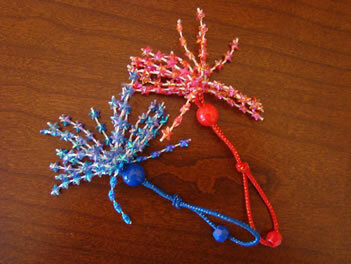 Or, try tying them end to end for a more dimensional runner! This one is a lot of fun. 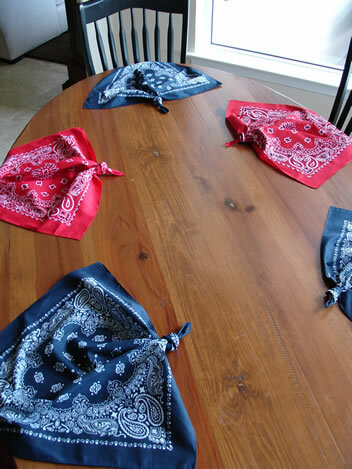 I think the bandanas are cute as placemats as well. 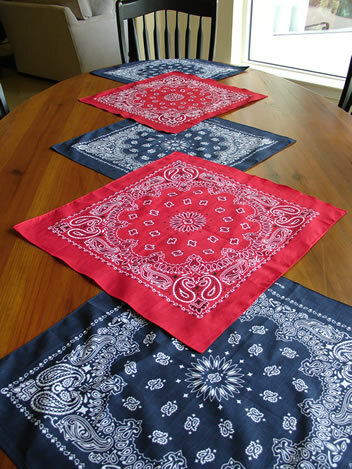 And remember, even if you don’t “find” these around your home, they are available at many craft and fabric stores and are less expensive than buying real placemats! Here’s one last cute Memorial Day idea. I was in the JoAnn’s the other day and came across these little girl’s hair clips. 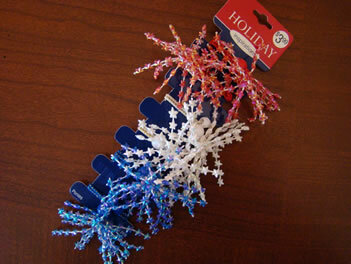 They are actually those stretchy covered rubber bands with a holiday red, white and blue bead decoration. My first thought? Napkin rings! Well, here are some things that might be fun for you and your family to try this holiday season. The best part about many of these projects is that they can work for all the summer holidays! More bang for the buck!